James “Jim” Leroy Marker, 66, military veteran, father, humanitarian, environmentalist, water protector. Killed by Citrus County Sheriff officers on February 26, 2017. Please join Sabal Trail Resistance (STR), Vets For Peace and other activists in honoring James “Jim” L. Marker by continuing to stand against the oil and gas pipelines that he lost his life fighting on Feb 26, 2017. THERE IS AN EVENT PAGE UP ON FACEBOOK, PLEASE SHARE AND INVITE WIDELY. 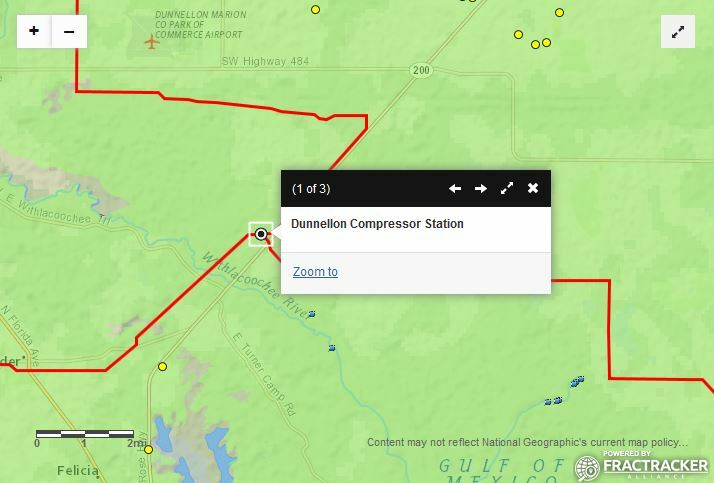 Map of the Dunnellon Compressor Station, just south of where Marker damaged the pipeline and equipment, approx. one mile from where the pipe was drilled under the Withlacoochee River. Those who may be driving from afar, there is a nearby campground in Ross Prairie State Forest for $22 a night. There is also camping at Rainbow Springs State Park for $30 a night. Reservations are required for both, and sites fill up quickly on weekends. There are other options in the vicinity, including Goethe State Forest (which requires requesting a free permit), free “dispersed” camping in the Ocala National Forest, 30 minutes east, or hotels in Dunnellon. We have set up a memorial page maintained by STR, which can be found here, for those who wish to share condolences, thoughts and stories about Jim’s life. Last month, before finding out the identity of the man killed by the Citrus County Sheriff’s Office, STR responded with a vigil at a site of the Sabal Trail pipeline where police indicated there was damage done to equipment that prompted them to initiate a fatal high speed chase. Upon release of Jim Marker’s identity, we released an initial statement providing context to the area where the pipeline was damaged and what we were able to learn about Jim. Since that time, more information has surfaced. Initially some media outlets reported a gun battle with the police. Citrus County has since confirmed that no shooting occurred in their direction. It has been near a month and yet there has been no proof presented that any threat was made to the police who killed him. Dash cam footage could explain this, but the sheriff has not indicated any intent to release this. Everything we have learned about Jim has reinforced the initial position we released indicating that he was known as a passionate, sincere and dedicated individual. He was a military veteran who served overseas as a combat medic. He was a member of multiple environmental, social and cultural organizations, as well as a missionary to a church in the Everglades serving people who struggle with recovery from drugs and alcohol. A neighbor at his previous residency in Fort Pierce noted that his generosity extended almost immediately to all he met, perhaps best exemplified by the power cord he had run from his own home to a homeless encampment nearby. Nothing about the action he took against the pipeline indicated any intent for violence against another person. What it did speak of is someone who was well-trained in military combat skills. Jim most likely learned to shoot as a soldier for the U.S. government. While we may never know his full intentions on February 26, his action spoke volumes: He was killed fighting the global tyranny oil and gas companies in the way that he saw most appropriate and effective. And who among us can judge him for that? While Jim acted alone last month, he acted in the context of thousands of like-minded veterans who joined the front lines of a pipeline battle at Standing Rock in North Dakota, declaring that their oath to protect this country included standing up for the water and those who protect it. And he was killed in the context of a nationwide epidemic of state violence, where police are able to kill with impunity, despite the steady flow of protests and uprisings that have occurred in response to police killings. An Amnesty International report from 2015 indicated not a single state in the U.S. has laws that meet international human rights standards for “use of force” by police officers. Though Florida is among the only eight states in the U.S. to require a verbal warning by police officers before shooting, there is no evidence to indicate if this occurred in Markers’ case. All information available to us at this time indicates that Jim died as an honorable warrior, killed for being a water protector of the Floridan Aquifer, which provides water to millions of people and countless other species. As such, he deserves to be remembered as a lover of humanity and the Earth. In his honor, we continue to escalate our fight against the Sabal Trail pipeline and we demand accountability from the law enforcement agency for the use of deadly force against him. We send our most sincere condolences to his family members and his friends who are left trying to understand his death. Further background and maps of Sabal Trail impacts can be found here.